The Samsung Galaxy Ace Duos S6802 is part of Samsung’s growing dual-SIM Android lineup. The hardware inside the phone is mostly the same as in the original Ace, save for the second SIM slot, of course. We don’t have many dual-SIM phones in our battery test database, so we’ll be testing the Ace Duos using only one SIM to make its results comparable. 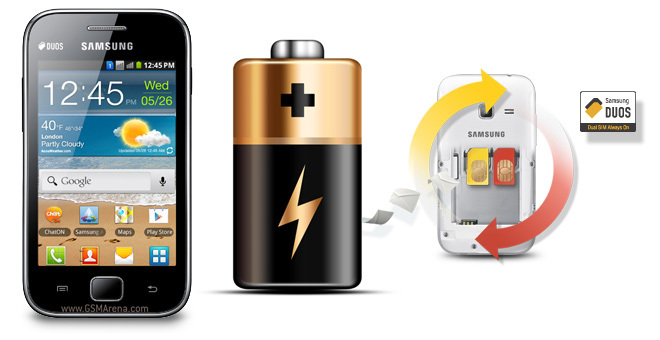 When it comes to talk time on a 3G network, Samsung advertises 7 hours of battery life. In our tests the phone came close to hitting that mark with its battery dying after 6 hours and 53 minutes of real-world call time. That puts it at the bottom third of the chart, so maybe you should consider sticking to 2G networks – according to official numbers, the Ace Duos should last for more than 18 hours of telephony on those. The Galaxy Ace Duos S6802 has a 1300mAh battery, so we’re not expecting miracles in web browsing (though having a relatively small 3.5″ screen should help). With a time of 4 hours and 45 minutes, the phone placed in the middle of the pack, which is probably more than you could expect. The phone also scored an average result in the video playback test. The screen may not be perfectly suited for watching videos and the phone has very poor codec support, but you should know you can watch about six and a half hours of SD footage on a single charge if you wanted to. 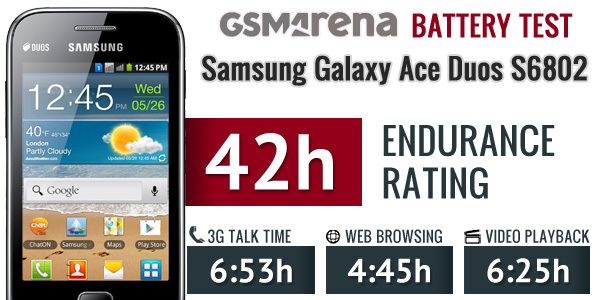 We tested the Samsung Galaxy Ace Duos S6802 using only one SIM card, but its standby performance proved to be excellent. So, even with two cards you should get plenty of battery life. Talking actively uses only one SIM (the other is in standby) and the other two tests don’t really depend on the number of SIMs, so we think the results are telling enough as they are. Anyway, with just one SIM, you can expect to go 42 hours before you need to charge the phone (that’s if you do 1 hour of calls, 1 hour of web browsing and watch videos for 1 hour every day). The Samsung Galaxy Ace Duos S6802 showed average performance – considering it’s an entry level device, that’s better than expected. Still, we’d recommend sticking to 2G mode if you need to make a lot of calls (there’s a “2G only” setting).